The Walking Dead spinoff announcement has really energized the fans of the show as it will give them another cool series to check out, along with some scenarios to dream about. What could it actually be about? At this point, the door is really wide open in terms of what the show could be about. It could be about the days before the zombie apocalypse, it could show what is happening in other parts of the country or even the world, or it could even fast forward to the future. Recently, the cast shed some light on what they might want to see in a spinoff. Emily Kinney, who plays Beth, Andrew Lincoln, who plays Rick Grimes, and Sonequa Martin-Green, who plays Sasha, all gave us their thoughts on the direction of the spinoff. As you can see, they all have a slightly different vision, which is a good thing! The door is wide open in terms of the spinoff, and the more ideas the better. The lead up to the the spinoff should be really exciting. The video is from their recent red carpet event that was for season 4 of The Walking Dead. The show will begin again this October 13th at its normal 9PM EST time slot. I would want to see the days before or leading up to the apocalypse…or what is happening else where. I’d like to see days leading up to the zobies and how it started. Orrr the cast that’s left survive and start lufe back the way it was before and start cleaning up thi gs and getting everything back in order and kill all the zombies its not like they can reproduce. .they’re dead. It’d also be cool to see other parts of the world. There really needs ti not be an ending. Like this is the best sjow o tv right now. It has amazing acting great action. I think it needs to go beack to days before and show how eberythi ng got so messed up how the first zombie came to be. And then go to were they start trying to get back tothe old ways with leaders and working and money flow and then the next season be the future and show how everythings back in order and its just talked about in history books! Don’t the bandwagoners realize it is based on a comic and there is no such thing as a “spinoff”. It’s already so far enough away from the original source material, don’t mess it up more. I am becoming desensitized to Zombie killing. The shock value made your show a huge success but it will wear off. It’s time for the writers and director to venture out on the road encountering small towns off the grid who know nothing about the disease. 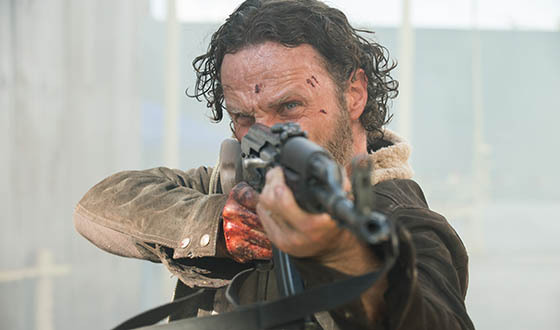 While visiting of Rick’s group has an accident and turns into a Zombie who infects the town. They need to find a cure and head to Jamestown VA to sail to England with hopes of finding a cure. It is time to hire additional writers and say goodbye to the Prison. Over the Thanksgiving weekend I was driving through the desolate flat desert we call west Texas with Walking Dead playing on my laptop on iTunes for distraction when I realized the unique challenges an arid landscape would play for a Walking Dead story. This lead me to think about other climates and to wonder how humanity would survive in these different circumstances. In the end (and apparently I am not alone), I found myself wondering why The Walking Dead cannot simply spin off like other series (e.g. CSI) with separate casts. Unlike these other spinoffs, interaction would be a challenge, possible only when one group or cast member crosses a vast geographical landscape…and didn’t we already lose one on her own? I normally do not get this into a show…which says something for the Walking Dead. I’m not into zombies or violence, but the story has an original humanity that draws me in. I would hope to see it spawn many more similar story lines well into the future.